DETROIT, MI -- Mike Ilitch, founder of the Little Caesars Pizza empire and owner of the Detroit Red Wings and the Detroit Tigers, died on Friday, according to his family. He was 87. Ilitch was praised for keeping his professional hockey and baseball teams in Detroit as other urban sports franchises relocated to new suburban stadiums. His family released a statement saying Ilitch was a visionary who set the tone for his company and his family. "He made such a positive impact in the world of sports, in business and in the community, and we will remember him for his unwavering commitment to his employees, his passion for Detroit, his generosity to others and his devotion to his family and friends," his son Christopher Ilitch said in the statement Friday night. Family spokesman Doug Kuiper said Ilitch died at a hospital, but no other details were provided. Ilitch and his wife, Marian, founded Little Caesars in suburban Detroit in 1959, and eventually grew the business into the world's largest carry-out pizza chain with several spin-off companies. Under his ownership and open checkbook, the Red Wings soared back to stability and won four Stanley Cup championships, and the Tigers - who'd scouted a young Ilitch in the 1940s - made it to the World Series. He was as much a fan of the often-struggling Detroit as he was of sports. When approached in 2009 by organizers of the Motor City Bowl in Detroit, Ilitch agreed to sponsor the annual college football bowl game despite a poor local economy. The game was renamed the Little Caesars Pizza Bowl. "It's a sporting event, and we need sporting events," Ilitch said at the time. "It picks our community up to no end, with all the great colleges we have in this state and the professional teams that we have. Thank God for 'em, especially at times that are rough right now." 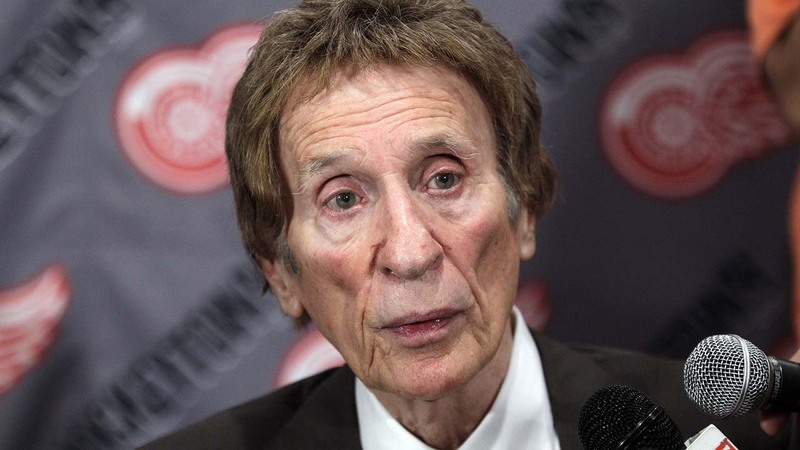 The son of Macedonian immigrants, Ilitch was born on July 20, 1929. He played baseball at Detroit's Cooley High School and was signed by his hometown Tigers after his four-year stint in the U.S. Marines, spending three years in the team's farm system before a knee injury ended his playing career. But he found his niche in business. His family's companies had combined revenues of $2.4 billion in 2011. It started with that first Little Caesars restaurant in Garden City, a working-class suburb west of Detroit. A food service distribution company soon followed to supply ingredients and other products for the growing number of restaurants. Blue Line Foodservice grew into one of the largest program account food service distribution companies in the U.S.
Ilitch Holdings Inc. was established in 1999 to manage the family's interests in food, sports and entertainment, and the company remained family focused. His son, Christopher, was president and CEO, while his wife, Marian, was vice chairwoman as well as sole owner of MotorCity Casino, one of Detroit's three casinos. Ilitch broke into sports ownership in 1982, when he paid a reported $8 million for the struggling Red Wings. Once a National Hockey League powerhouse, the team had bottomed out to mediocrity, but it began winning again under Ilitch. The Red Wings took home the Stanley Cup in 1997, 1998, 2002 and 2008. Ilitch was inducted into the NHL Hockey Hall of Fame in 2003, and into the U.S. Hockey Hall of Fame and Michigan Sports Hall of Fame a year later. "Mr. and Mrs. Ilitch are incredibly passionate about Detroit and their teams," Red Wings general manager Ken Holland told The Associated Press in a 2010 interview. "They create a family atmosphere with stability, loyalty and a personal touch. But we all understand we have to produce to be around for a long time." As part of his long-term plan to build a Detroit-based business empire, Ilitch also bought Olympia Entertainment, which manages several restaurants, sports and entertainment venues, in 1982. Husband and wife bought the downtown Fox Theatre five years later and started a massive, $12 million restoration. It reopened a year later and became a lucrative venue for musicals, plays and other productions. The Little Caesars world headquarters also was moved downtown. Then, in 1992, the man who once dreamed of playing for the Detroit Tigers bought the team for $85 million. He moved it in 2000 from the storied but fading Tiger Stadium to Comerica Park, across from the Fox Theatre. Unlike previous owners of both sports franchises, Ilitch opened his checkbook to sign top players - finding solid success in hockey, and a rollercoaster in baseball. The Tigers lost an American League record 119 games in 2003, but advanced to the World Series three years later, losing in five games to the St. Louis Cardinals. Near the end of a disappointing 2008 season, Ilitch said he and the team would review everything done to put the roster together but focusing on the $138 million payroll wasn't the priority. "I'm not afraid to go out and spend money," he said. "It's been very costly, but I'm not going to change my ways." The Tigers made the American League playoffs in 2011, a return to winning that brought more fans to Comerica Park. Tigers general manager Dave Dombrowski said Ilitch was simply driven to win. "He has a good feel for sports, baseball in particular, and that's always good when you're working for someone like that," Dombrowski said in 2010, shortly after Ilitch announced he would try to buy the Detroit Pistons. Ilitch had jumped in amid speculation another buyer might move the pro basketball team. "When I read in the paper there was the chance that this great sports town could lose one of its professional sports franchises, I just didn't see how we could let that happen," Ilitch told The Associated Press in 2010. "The Pistons, just like the Red Wings, Tigers and the (Detroit) Lions, have a rich and storied tradition in this community." California billionaire and Michigan State University graduate Tom Gores eventually bought the Pistons and kept the team at its stadium in Auburn Hills, north of Detroit. Ilitch's admiration of Detroit also was put on display in 2009, when General Motors - struggling under the threat of bankruptcy - discontinued its sponsorship of the popular General Motors Fountain at Comerica Park. Instead of selling the space to other bidders, Ilitch gave the advertising spot to each of the area's car companies that season at no cost. "He cares about the city of Detroit. This is something he wanted to do. It's for the Big Three," Ron Colangelo, the Tigers' spokesman, said at the time. Philanthropy always was a major focus. In 1985, he established the Little Caesars Love Kitchen, a restaurant on wheels to feed the hungry and help with food distribution following national disasters. Ilitch founded the Little Caesars Veterans Program in 2006 to provide honorably discharged veterans the chance to own a Little Caesars franchise, and his Ilitch Charities invests in programs promoting economic and job growth. Contributions, sponsorships and in-kind donations from the Ilitch companies total more than $4 million per year. Ilitch is survived by his wife, seven children and numerous grandchildren.